I had a pretty good start January this year. On a typical Sunday I could do at least 10k and on a “short week” Saturday I could do up to 15k or more depending on the new route we plan to explore. May is a good month, I exceeded 100k which is a new milestone! 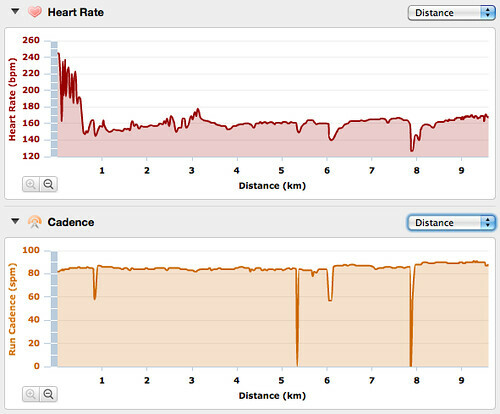 Heart rate spikes during run bothered me for a while. I trusted the electronic gadgets I bought and the near 35 years old technology. In fact there are all sort of issues that may affect the accuracy of such devices. Last Sunday it was pretty hot and humid early in the morning before 8am, I have my HRM put on and Garmin activated in workout mode. I was just talking to my friend while waiting for my brother to be ready. Wow a quick glance at my Garmin I noticed heart rate of over 200, that can’t be right. It turned out that HRM transmits signal doesn’t mean reading is accurate. My HRM was detectable by the Garmin as my skin was “wet” at that temperature however reading was in error because my skin wasn’t “wet enough”. So I decided to ignore that, said what the hell, if the gadget is broken I don’t want to spoil the morning run due to that. In fact I have already tighten up the belt a bit that morning. Below graphs show how unreliable this gadget can be. It took as much as 500m+ to get the conductivity right at the electrodes. So the learning is: feel your body don’t trust the electronics those are for fun only! This entry was posted on	May 31, 2011 at 10:01 pm	and is filed under Uncategorized.